- Chester Beatty Museum. The best small museum I've been to, full of jaw-dropping, how-the-hell-did-this-wind-up-here artifacts and books. - Jack B. Yeats wing at the National Art Gallery, and the Caravaggio too. This is on the tourist lists, but I hit it every time I'm home. Afterwards, cross the road and picnic in Merrion Square and give Oscar Wilde a hug. - Grogans. There's no trad music, no ye olde decor, no paddywhackery. Just old men, artists and students, pints and somewhat dodgy art. Order a pint and a toasted cheese sandwich. If you really want the ye olde bit, hit Stag's Head, which manages to be a decent pub despite being on the tourist radar. I like the snug in the back. - Shopping at Powerscourt and George's Street Arcade. I love Bow Boutique and the Designer Centre, plus there are unaffordable antiques to eye up. Jenny Vander is great for vintage clothes. All are within a stone's throw of each other, off Grafton Street. - Trinity. I went to university here. So did Beckett. And it has this library... 'nuff said. - Howth. Close to my family home turf. I love to climb Howth Head and look out over the city. Everybody gets fish n' chips and takes them down the pier too. Howth is accessible by DART. - Glendalough / Powerscourt Estate. I adore the gardens at Powerscourt. 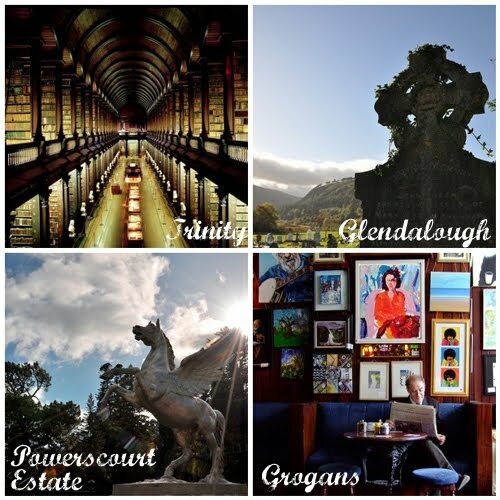 Glendalough & Powerscourt are both real tourist destinations but lots of Dubliners hit them on the weekend too. Lunch at Avoca in Powerscourt is always tasty especially if taken outside. You'll need a car to visit these places, though there are tourist coaches, which I wouldn't be seen dead on. My favourite road in all of Ireland is the one that hugs the coast around The Burren. I always take in the Poulnabrone Dolmen, Fanore Strand, Cliffs of Moher. This Burren portion of this loop is a doable detour even if you're ultimately striking north from Galway. If you're continuing south, I recommend staying in Doolin. After Clare, I usually take the Killimer-Tarbert ferry and do a drive up and around one of Kerry's penninsulas before heading to Cork / Cobh and then zipping back to Dublin, through Cashel. 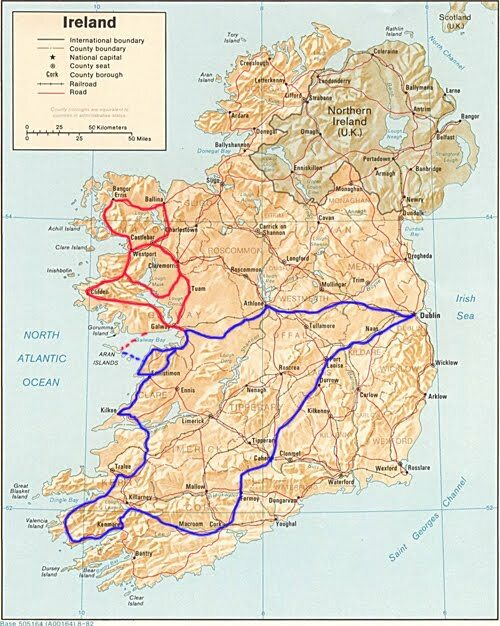 Alternatively, strike north once you get west, heading up through Galway to Connemara and Yeats country. 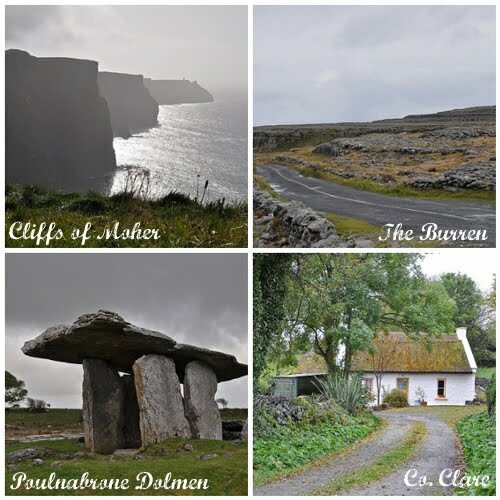 The Aran Islands are accessible by either loop (from Doolin when headed south, from Rossaveal on the way out of Galway) and, though touristed, are worth the trip. While in this vicinity, lots of people like to visit Kylemore Abbey, though I'm always left with mixed feelings about Catholic ostentation in the middle of rural Ireland. I much prefer older abbey ruins, preferably with cloisters, which you'll find lots of examples of (like Corcomroe Abbey in Clare). Connemara is more wide and roaming than the Burren, with lots of wide bogs in the foothills of the mountains. I find it more bleak, mysterious and beautiful in an entirely different way. You're in Yeats country now, so you might check out his grave, Lissadell and enjoy epic views of Ben Bulben. The Lough Gill Drive is a popular spin to take. I wish I had restaurants and B&Bs to recommend, but I always fly by the seat of my pants, eat picnics and in pubs and stay in whatever B&B looks good where I land. If you're a real foodie, Cork is the county to aim for with restaurants like Cafe Paradiso being popular. I also had one of the best meals of my life at Aniar in Galway. Notes: This is supposed to be a curated rather than comprehensive guide... basically what stands out for me when I visit home or have visitors. I've toured Ireland a lot and shown many, many friends around and this has proved repeatedly to be my no-fail mix, both for first-time visitors and for myself. I think the biggest factor is not what you see but how you get there. Touring coaches swarm in and out of places and mostly get under everybody's skin. If your budget permits, renting a car to travel solo is the best possible choice. Finally, if you've traveled all the way to Ireland, don't waste the opportunity to get to the West. It only takes 3-4 hours to get to and it's really where all the magic is.